This article explains how to set up a Device-Mapper Multipath, without DM-Multipath, each path from a server node to a storage controller is treated by the system as a separate device, even when the I/O path connects the same server node to the same storage controller. DM-Multipath provides a way of organizing the I/O paths logically, by creating a single multipath device on top of the underlying devices. In computing, iSCSI is an acronym for Internet Small Computer System Interface, an Internet Protocol (IP)-based storage networking standard for linking data storage facilities. By carrying SCSI commands over IP networks, iSCSI is used to facilitate data transfers over intranets and to manage storage over long distances. iSCSI can be used to transmit data over LANs, WANs… The protocol allows clients (called initiators) to send SCSI commands to SCSI storage devices (targets) on remote servers. It is a storage area network (SAN) protocol, allowing organizations to consolidate storage into data center storage arrays while providing hosts with the illusion of locally attached disks,for more information. 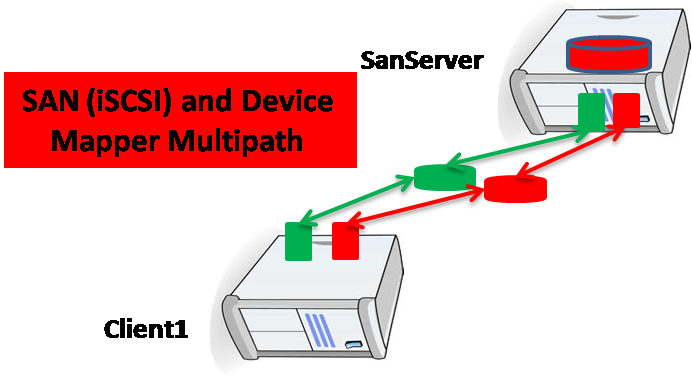 Redundancy: DM-Multipath can provide failover in an active/passive configuration. In an active/passive configuration, only half the paths are used at any time for I/O. If any element of an I/O path (the cable, switch, or controller) fails, DM-Multipath switches to an alternate path. Improved Performance: DM-Multipath can be configured in active/active mode, where I/O is spread over the paths in a round-robin fashion. In some configurations, DM-Multipath can detect loading on the I/O paths and dynamically re-balance the load. polling_interval : Specifies the interval between two path checks in seconds. For properly functioning paths, the interval between checks will gradually increase to (4*polling_interval ). The default value is 5. Verbosity : The default verbosity. Higher values increase the verbosity level. Valid levels are between 0 and 6. The default value is 2.
path_selector : Specifies the default algorithm to use in determining what path to use for the next I/O operation. Possible values include: round-robin 0 :Loop through every path in the path group, sending the same amount of I/O to each. path_grouping_policy : Specifies the default path grouping policy to apply to unspecified multipaths. Possible values include: failover : 1 path per priority group. user_friendly_names : f set to yes, specifies that the system should use the /etc/multipath/bindings file to assign a persistent and unique alias to the multipath, in the form of mpath. If set to no, specifies that the system should use the WWID as the alias for the multipath. In either case, what is specified here will be overridden by any device-specific aliases you specify in the multipaths section of the configuration file. The default value is no. And more… you can find it is this URL. By default, DM-Multipath includes support for the most common storage arrays that support DM-Multipath. The supported devices can be found in the multipath.conf.defaults file.